Elegantly appointed with an applied serpentine ornamentation, this gorgeous Czechoslovakian cased glass orange vase features a delicate ruffled jet rim. 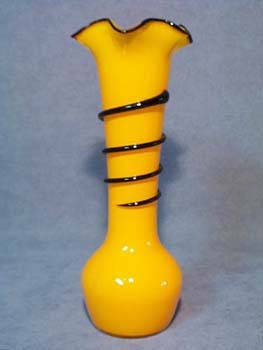 Measuring almost 9-1/2" tall, this beautiful hand crafted vase no longer has it's paper label. It shows one 3/4" air bubble and a couple of tiny ones, but has no cracks, breaks, or repairs, and the serpentine point is sharp and intact.